In this article the properties of the PlotBandAnnotations are described depending on the type of axis the annotation is associated with - cartesian, polar or radial. Axis: the cartesian plotband annotation needs to be associated with horizontal or vertical axis explicitly. From (of type object): the starting value for the plotband. >When the axis is numerical (Linear or Logarithmic) a numeric value is expected, and when it is a CategoricalAxis - a category is expected. To (of type object): the ending value for the plotband. >When the axis is numerical (Linear or Logarithmic) a numeric value is expected, and when it is a CategoricalAxis - a category is expected. From (of type double): the starting point for the plotband. To (of type double): the ending point for the plotband. From (of type object): the starting point for the plotband. >When the radial axis is NumericalRadialAxis a numeric value is expected, and when it is a CategoricalRadialAxis - a category. To (of type object): the ending point for the plotband. >When the radial axis is NumericalRadialAxis a numeric value is expected, and when it is a CategoricalRadialAxis - a category. CartesianPlotbandAnnotation is either a horizontal or a vertical stripe that crosses the whole chart and marks a value range on the associate axis. 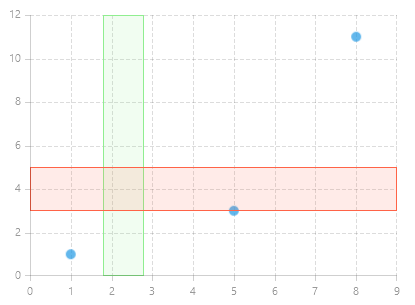 Here is an example that demonstrates how to define both horizontal and vertical CartesianPlotBandAnnotation in a RadCartesianChart. 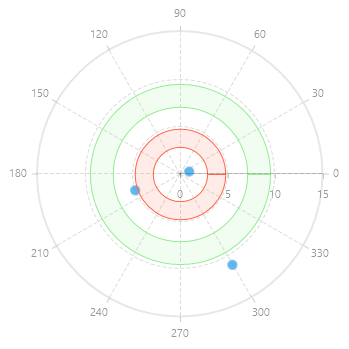 PolarAxisPlotBandAnnotation is represented by concentric stripe that mark a specific value (radius) range on the polar axis. This example demonstrates how to define PolarAxisPlotBandAnnotation in a RadPolarChart. 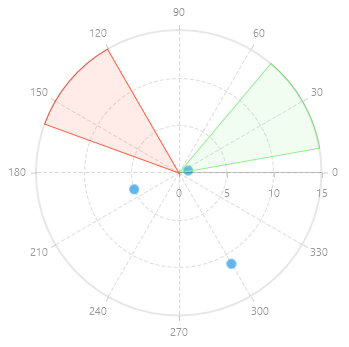 RadialAxisPlotBandAnnotation is represented by a sector of the circle (pie slice) that marks specific angular/categorical range. This example demonstrates how to define RadialAxisPlotBandAnnotation in a RadPolarChart.